Slovenia is bracing for a refugee influx after Hungary shut its border with Croatia to try to stem the numbers arriving en route to Western Europe. Refugees have already begun to arrive in Slovenia by bus from Croatia. Hungary closed its Croatia frontier on October 16 and now says it will reintroduce controls on its Slovenia border. Many of the refugees aim to continue north to Austria and Germany. Nearly 600,000 refugees have reached the EU by sea so far this year, many travelling from Turkey to Greece. However, more than 3,000 have perished trying to cross the Mediterranean. Many refugees are Syrians fleeing the civil conflict there. Hungary said it shut the border with Croatia after EU leaders failed to agree its plan to send a force to prevent migrants reaching Greece. The closure of Hungary’s border with Croatia comes just a month after it shut its frontier with Serbia, which was another transit route to Western Europe. Foreign Minister Peter Szijjarto said border controls with Slovenia would be temporarily reinstated to safeguard Hungary from a “mass wave of unidentified, uncontrolled refugees”. Hungary and Slovenia are both part of the passport-free Schengen zone, but Croatia is not. Until October 16, 5,000 to 8,000 people were being allowed across Hungary every day, without registration, bound for Austria. There are fears in Slovenia, a nation of some two million people, that the latest border closure will channel many more migrants through the country. Extra police had been deployed to the border with Croatia, Slovene Interior Minister Vesna Gjorkos Znidar said. However, Slovenia will keep accepting refugees as long as Austria and Germany’s borders remain open, she said. Slovenia’s national security council is due to meet on October 17. All passenger rail transport from Croatia has already been stopped. Those arriving by road will be transferred to a migrant centre near the Austrian border after a registration procedure, AP quoted police spokeswoman Suzana Raus as saying. The past month has seen some 3,000 refugees pass through Slovenia, Reuters news agency reported. 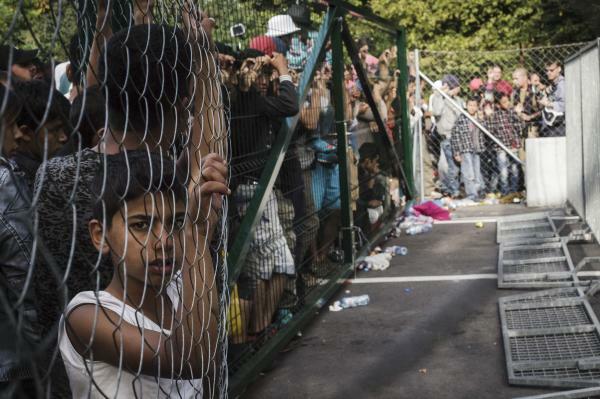 Slovenia has said it was in a position to accommodate up to 8,000 refugees per day.